This week on The Vermont Garden Journal, Charlie Nardozzi offers tips on growing and enjoying peonies. Listen for advice about peonies, including successful transplanting and disease control. I’m Charlie Nardozzi and this is the Vermont Garden Journal. There’s no more audacious and dramatic flower than the peony. However, many gardeners don’t realized that peonies were grow for thousands of years for their medicinal purposes as well as their beauty. 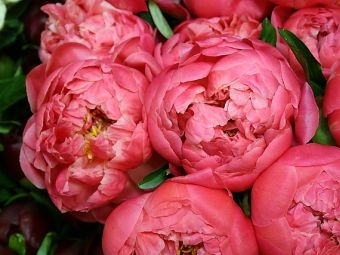 The Chinese used peonies to relieve pain and cleanse the blood. Europeans used them for ills such as gall stones, bad dreams, and to ward off evil spirits. We mostly grow them, though, for their flowers. Herbaceous peonies are the ones most gardeners are familiar with. These 2-to 4-foot tall and wide plants have floppy, softball-sized flowers in colors ranging from deep burgundy to white. If you forgot to stake or support your peony flowers to keep them off the ground, wrap chicken wire around plants now to keep the flowers upright. I like the tree peonies. These woody plants have a stately structure. Although not as hardy as herbaceous peonies, some varieties produce unique yellow colored flowers. Peonies grow best in full sun, on well drained soil, and like my cat, don’t like to be moved. If you must move or divide your peonies, do so in September. Dig a large hole, remove the whole clump, divide into good sized sections, and plant the crown so it’s only 1- to 2-inches below the soil line. Any deeper and it will be slow to flower. In fact, other reasons peonies stop flowering include lack of light, overcrowding, and too much nitrogen fertilizer. There are few diseases that attack peonies, but one I see during wet springs is botrytis blight. This fungus causes the flower buds to dry and shrivel before opening. Give plants plenty of space to allow the leaves to stay dry. During wet springs, spray with Serenade to prevent damage. Now for this week’s tip, thin apples now so there are 1- to 2-fruits per cluster and 6-inches between clusters on the branch. There will be fewer, but better quality fruits. Next week on the Vermont Garden Journal, I’ll be talking about the beetles, yea, yea, yea. For now, I’ll be seeing you in the garden!